*Note: Several years ago, an artist gave me this plaque he had created and said to use it as I wished. I do not know the name of this gracious young man so I am unable to credit him. If you are the artist or know his identify, please email me so that I can give you/him credit. This piece has been in my studio for many years and continues to be a source of inspiration. Sculpture by Osa Caudill, inspired by the cover of Mind Thieves, a sci-fi thriller by Tom Kenyon. 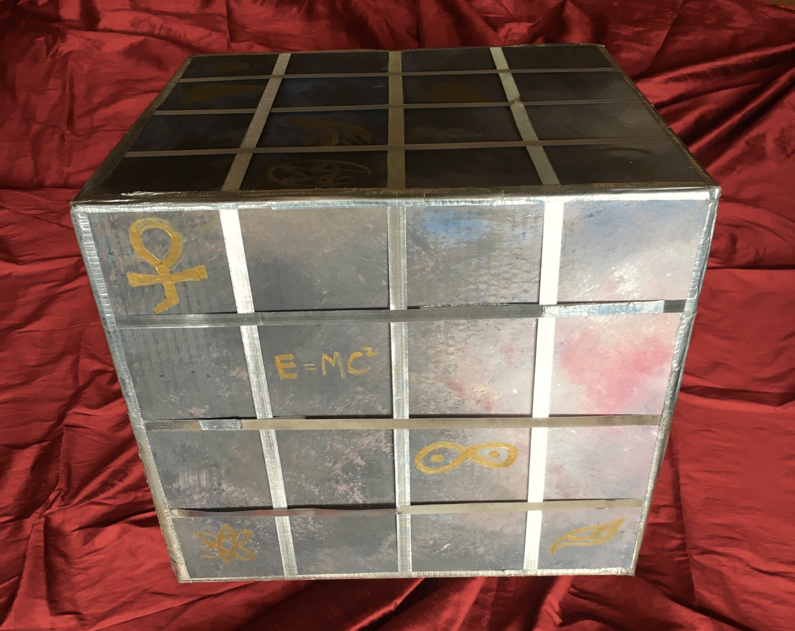 The Imaginary Box is a mental device that can be used when encountering new information outside the domain of your personal experience. I think it is vital, especially when dealing with information that comes to you via altered states of consciousness (such as meditation), to filer it through your knowing-ness, sense of logic, life experience and your own personal values. Don’t accept something as truth no matter what its origins might be. This is especially true in spiritual circles where some people tend to give away their power to the “teacher” or guru. Test all new concepts with the litmus test of personal experience. If a new concept seems to be outside the realms of possibility, just toss it in the Imaginary Box. This will allow you to assimilate other ideas that seem more plausible. You can then come back to the Box to take another look at what’s inside at a later time—if you so choose. Swallowing ideas whole, without “chewing on them,” can create a type of mental indigestion. The Imaginary Box allows you the grace to take a closer look at new concepts and decide whether you wish to “chew on them” or not, as you wish. This body of information comes from The Aethos, the 10th -12th dimensions of the Hathorian realms of light. These Hathors are viewed by other Hathos, that reside in the lower dimensions of light, as their spiritual teachers. Hathors who have entered The Aethos emanate energies of comfort, healing and high realization. 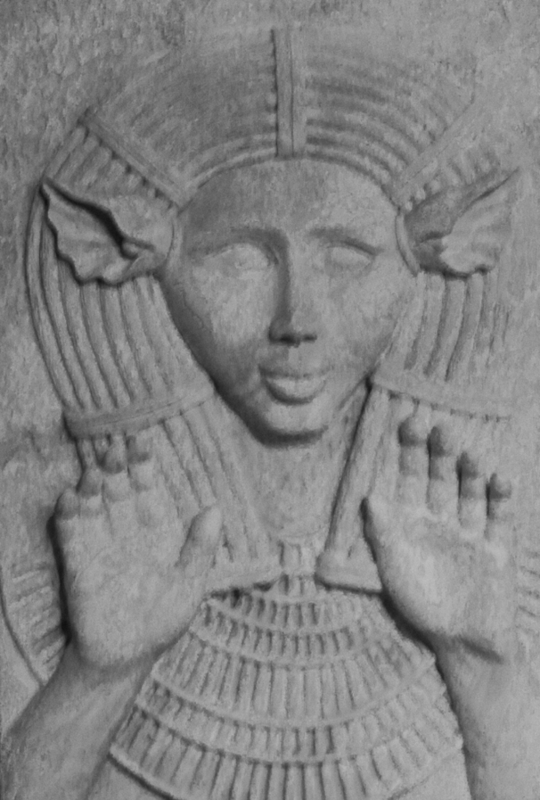 Their forms have gone through a radical metamorphosis and no longer resemble classic Hathor bodies. Generally speaking, beings in The Aethos have geometric forms, usually spheres—especially luminous white spheres. Those Hathors who have evolved into the highest realms of light and entered The Aethos have done so by penetrating the illusion of form and made contact with Pure Consciousness itself—the Mother/Birther of the holographic displays of light that are responsible for all matter throughout the Multiverse as well as all forms of light in the light realms of being. In other words, all that exists in the innumerable worlds of duality is due to the interactions of holographic light, which can be characterized as Radiance—one of the fundamental expressions of Pure Consciousness. Due to the fact that Pure Consciousness is non-dual in nature, meaning that all conflicts and opposing forces are resolved in its presence, The Aethos emanates the qualities of non-duality to those who interact with them. The Aethos is highly compassionate, but like all Hathors it does not intervene into human affairs. They are more like a witness to the suffering of other beings, including those who are sentient (like we humans) as well as whole other classes of aware but non-corporeal beings. While The Aethos does not intervene, its emanations of compassion, healing and non-duality can have an elevating effect on those who interact with them. Hathors within the Aethos have a unique perspective on the nature of reality as it is grounded in their connections to Pure Consciousness and what they refer to as The Seven Pure Lights. Please do note that those beings who reside in The Aethos are not the only beings who have reached this level of realization. They share this perception with many other types of beings—as noted in the short section on Comparative Perspectives. While these other enlightened beings have much to offer, we will be focusing our attention on how beings within The Aethos perceive “reality” as well as their suggestions for those of us who live in the world as embodied beings. All perception is relative to the observer. Thus, from this perspective, there is no one single “Reality,” but rather multiple perceptions that beings perceive as real based on their unique perspectives. For our purposes, we can divide the perception of “reality” into two distinct polarities. On the one hand, there is the perspective held by those beings who are embodied and who experience of the throes of duality (seeing as how their interpretation of the world is based on their five senses and the sensory-based world of perception is constantly shifting and changing). On the other hand, let’s take the perspective of those beings who have made authentic deep contact with Pure Consciousness itself, which is non-dual in nature. For these beings there are no throes of duality, as all dualities have been resolved into a quiescent state of spacious awareness. Furthermore, while embodied sensory-biased individuals can experience tremendous emotional upheaval in the face of dualistic difficulties, beings who are anchored in Pure Consciousness do not experience emotional turmoil even when events around them are tumultuous. I personally think that a very resourceful and elegant way to resolve these seemingly irreconcilable differences in perception can be found through the work of the German philosopher George Fredrick Hegel. While the concept is generally attributed to Hegel, some scholars say that Johann Fichte was actually the first to use the actual terms. Using Hegel’s model, let’s say that our normal perception of the world and the cosmos is our Thesis—in other words, matter is real. Time is real, though relative to the effects of gravity. And our sensory experience of the world around us, while variable, can generally be trusted to give us an accurate picture of things. Our five senses are, after all, the means by which we successfully navigate the many situations facing us in our day-to-day lives. Those beings who have made authentic and deep contact with Pure Consciousness experience the world in a very different manner than most sentient beings. For them, matter is illusory in nature. And they respond not to the illusion but to what lies beneath it. For these types of beings, duality itself is also an illusion. This radical departure from the perception of most embodied beings is due to the fact that this order of beings lives in Spatial Cognizance—the state of being aware of being aware and are thus deeply rooted in Spacious Awareness, (i.e., Pure Consciousness). For them the worlds of matter, and even those worlds that lie in other dimensions, are all a result of the play of light, and this light is simply a display of Radiance that originates and emanates from Pure Consciousness. One synthesis of these two very divergent states of perception could be described as a state of awareness that includes both polarities—in other words, matter is real when perceived in one state of mind and unreal when perceived from another state of mind. Those who have made deep contact with Pure Consciousness, or Spatial Cognizance, often enter an altered state of awareness called Samadhi (Sanskrit), which is an internally directed state of awareness characterized by non-ordinary perception including profound alterations in perceived time and space, as well as a heightened sense of transcendence and bliss. Usually when one enters Samadhi, one’s awareness of the external world disappears altogether, and one is fully engaged with internal realities. But there is another form of Samadhi that could be described as Functional Samadhi, which is the synthesis of both polarities—functioning simultaneously in the sensory-based reality of day-to-day life and the transcendent states of awareness that spontaneously arise when one enters Spatial Cognizance. Using a metaphor borrowed from physics, our day-to-day perception of the world could be likened to Newtonian physics, while entering Spatial Cognizance could be likened to entering the realm of Quantum Mechanics at an experiential level. While these two types of reality are very different, human consciousness has an innate ability to be aware of and operate within both realities simultaneously. This is a very advanced state to be sure, but it is part of our innate (albeit often unused) human potential. While it may be true that this unusual state of perception is highly innovative, it is fundamentally a complex skill set and like all skill sets—it can be learned. The Art of Psycho-navigating Spatial Cognizance is an expression of this dual nature. And like all art forms, it is something you get better at the more you practice it. The concept of the Multiverse is nothing new as sages from various spiritual traditions have described it for thousands of years. The central idea is that our universe is one of many, and it is possible to make contact with these alternate universes through meditative states of mind. According to the Hathors, the Multiverse consists of innumerable universes, and it is possible to make contact with highly evolved beings, as well as the restorative and enlightening subtle energies, that reside in these universes—as s a means to accelerate your own evolution. Sir Issac Newton (1704) in his book, Opticks, suggested the idea of a Multiverse and in 1952 the physicist Erwin Schrodinger commented upon a set of equations he had derived that indicated that multiple realities could be occurring simultaneously. The late Dr. Richard Hawkins also subscribed to the notion of a Multiverse. According to the Hathors, consciousness is one continuum with many expressions. While humans generally put a dividing line between the personal, transpersonal, and transcendent aspects of being, such delineations are arbitrary—at least in the Hathors’ view of reality. Furthermore, due to the influences of religion, many humans put a dividing line between the Divine (i.e., the transpersonal/transcendent) and the day-to-day reality of human life. According to the Hathors, there are no barriers or dividing lines between our human existence and our transcendent natures—except for those hurdles imposed through conditioning. One unfortunate effect of a belief in barriers between our human nature and our Divine (i.e., spiritual or transcendent) nature is that we are cut off from the wellspring of insight and healing that is an innate part of our nature. Put another way, consciousness is a unified field and there are no boundaries between levels except those that are imposed by belief. Thus there are, in reality, no impediments or obstacles to the attainment of the higher levels of transcendent insight and their attendant abilities (i.e., the powers of consciousness or siddhis)—except for those that are self-imposed or imposed by society. One of the characteristics of Spatial Cognizance (i.e., Pure Consciousness) is that there is often an arising of spontaneous compassion. This capacity to witness the joys and suffering of other sentient beings is due to the recognition of our interconnectedness, or Oneness. This sense of Oneness emerges as one enters Spatial Cognizance, or Pure Consciousness, but is obscured when one enters the more contracted states of personal embodied existence. One reason for this difference can be traced back to our biological roots—and the necessity for boundaries. Biological life cannot perpetuate itself unless there is both interconnectedness with other life forms and the environment and, at the same time, the functioning of appropriate biological boundaries. Every cell in your body has a cell wall. Without this wall there would be no biological integrity. Without cell walls, for instance, you would be a mass of protoplasm. It is the differentiation between cells and their boundaries that allows your body to operate. It is important when exploring states of mind associated with the transpersonal and the insights that arise during Spatial Cognizance to keep one foot on the ground, so to speak. In other words, pay attention both to your interconnectedness with other beings and also to the necessity for boundaries. If you become confused about this, it can lead to all types of personal and interpersonal problems due to a misunderstanding about the necessity and validity of personal boundaries. The Hathors say that within our multi-dimensional selves, we all have Dimensional Tendencies, which are like seeds that we “planted” in our own consciousness through repetition of experience or patterns of thinking—and in some cases having a set of beliefs imposed upon us—such as religious or social conditioning. These “seeds” or Dimensional Tendencies will blossom when the right conditions are present. Most humans, according to the Hathors, are a mixture of benevolent and negative tendencies. Part of the Work is to identify your own Dimensional Tendencies and clear out those that are destructive or negative in nature. It is strongly suggested that you have some type of ethical system in place so that you can more easily spot any negative tendencies in yourself before they manifest in your outer reality. You can explore The Multiverse without any ethical considerations, but I do not advise it. My reasons for this position are multifold. For one, the Multiverse is brimming with all types of energies and beings who possess varying degrees of positive and elevating effects. But not all energetic beings are benevolent, which is one reason the Hathors strongly suggest entering a state of high coherency (via coherent emotions) as a means to insure that you are in a higher vibratory field—so that you interact with beings equal to or surpassing your level of attainment. In my opinion it is important to have an ethical system in place to protect you and others from the accumulation of spiritual powers that you might draw to yourself as a result of interacting with The Multiverse. For the sake of my own elevation and the elevation of all life, I shall strive to be harmless to myself and others. Note that this is not a vow. You are simply stating that you will strive to be harmless to both yourself and others. If you fail to be harmless to yourself or someone else, the goal would be to explore why you tried to inflict harm—not condemn yourself because you failed. This approach will bring you deeper insight into your own unconscious motivations, which is invaluable. Some people have told me that striving to stop harming themselves was one of the most enlightening things they had ever experienced. An ideal time to state this Niyama is to say it silently after you complete any of the meditations or psycho-navigations that you have learned in this Intensive. The opportunities for personal growth and development are extraordinary for those who Psycho-navigate Spatial Cognizance. But there is a danger in this as well. The danger is that as the world goes deeper and deeper into chaotic states, more and more individuals will escape the realities of a changing world by “hovering” or “floating” in dissociative states of mind. This is not enlightenment nor is it Spatial Cognizance. It is delusion. To be a consummate psycho-navigator, one must—in my opinion—be aware of this tendency in oneself. If the collective human consciousness enters a deeper state of denial and avoidance of its own shadow material, then there will be more and more escapism—in all its forms. Hovering, or floating, in a dissociative state under the guise of spirituality is not liberating. By being aware of possible dangers on the ascent to higher states of consciousness, you will assure yourself a greater probability for success. This type of success is nothing short of bridging the worlds by making choices based on both the realities of our sensory-based existence and the inspiring mind-opening world of our transcendent natures. If you choose to master the Art of Psycho-navigating Spatial Cognizance, you will no doubt attain deep spiritual insight and in many cases, various siddhis or powers of consciousness. Part of this is to avoid drawing attention to yourself, as this can create impediments to your progress through such things as jealousy, judgments by others, as well as an unconscious move to over-mythologize your experiences or to make them more impressive so that others might admire you. This would indeed be a very unfortunate turn of events should your main focus be on self-aggrandizement rather than on the mystery of how Pure Consciousness and its unbounded unconfined nature can be joined with the realities of your day-to-day life. By remaining silent about your achievements, you cultivate Dimensional Tendencies that protect your inner sanctum—that inner most place in consciousness where you are deeply in touch with aspects of your being that transcend the limitations of time, place, circumstance and history. It is a place of profound renewal and healing, but it can only be experienced directly. The Art of Psycho-navigation has two portions. The first portion is first and foremost a means to explore the depths of your transcendent (i.e., transpersonal) realms of being). And the second portion is to bring those resources to bear as you live your life. The Hathors’ perspective on Spatial Cognizance shares similar territory with some of the world’s spiritual traditions—specifically those that deal with aspects of consciousness that transcend our perceptions of time and space. Notice the parallels between a statement made by the Hathors about Spatial Cognizance with statements made by Lao-tzu, a Taoist, Tulku Urgyen, a Tibetan Buddhist and Meister Eckhart, a Christian Mystic. There are many other examples from other spiritual traditions I could touch on. But in this brief space, the point I wish to make is that the Hathors’ view on the nature of ultimate reality is not unique to them although I will say this—their methods for making contact with transcendent reality is unique and non-dogmatic. “The beings who reside in the Aethos are our spiritual teachers for they have transcended the illusory effects of projected holographic light that most beings perceive as reality. The Aethos has, instead, fully entered into the very ground of consciousness itself. This quote is from a manuscript attributed to the great Taoist master, Lao-tzu entitled, Wen-Tzu: (Understanding the Mysteries). Lao-tzu is a semi-legendary figure who some historians say was a contemporary of Confucius in the 6the century BC., while other historians place him in one of the warring periods during the 4th Century BC. A prolific philosopher and writer, Lzo-tzu is credited with establishing the philosophical underpinnings of Taoism and with creating the divination method of the Tao Te Ching. This quote is from Tulku Urgyen Rinpoche, a Dozgchen Master (1920 – 1996) who was a Master of both the Kagu and Nyingma Tibetan Buddhist Lineages. Tulku Urgyen is generally regarded as one of the greatest Dozgchen Masters of our modern time. When a Dozgchen master dies, there are several phenomena that can present themselves, the Rainbow Body being one of them (meaning that the physical body returns to its true nature as The Five Pure Lights). The lights appear physically and can be seen by other human beings. As the lights radiate, the physical body gets smaller and smaller until it disappears. Another phenomenon has to do with the weather. When an accomplished Dozgchen master dies, sometimes the skies get completely clear. This is symbolic of the clarity of Pure Consciousness—or rigpa, as it is referred to by Dozgchen practitioners. When Tulku Urgyen died, the heavily polluted sky over Kathmandu became crystal clear for several days. The quotes, above are from the German philosopher theologian and mystic, Meister Eckhart (1260 – 1328). He was renowned in his time as a gifted teacher and a profound mystic, but some of his views brought him in conflict with the Papacy. His mystical orientation was seen as an affront to the terrestrial powers of the Church, which based its spiritual authority on the idea of Apostolic Succession. Mystical approaches to the mystery of Christ were often seen as heretical by Church authorities because they bypassed the need for the priesthood and viewed the mystical nature of Christ as open and available to all persons without the need for an intermediary. This was the edifice that other great Christian Contemplatives of the Middle Ages used to directly experience the numinous (light filled) realms of the Christos for themselves without the need of the priesthood. This autonomous attitude of those who sought to enter the vibrational fields of the Christos and receive the blessings that such encounters with any numinous realms impart, were extremely vexing to the Church of Rome. Meister Eckhart was eventually tried as a heretic by Pope John XXII but, in a twist of irony, Eckhart died before receiving his verdict. 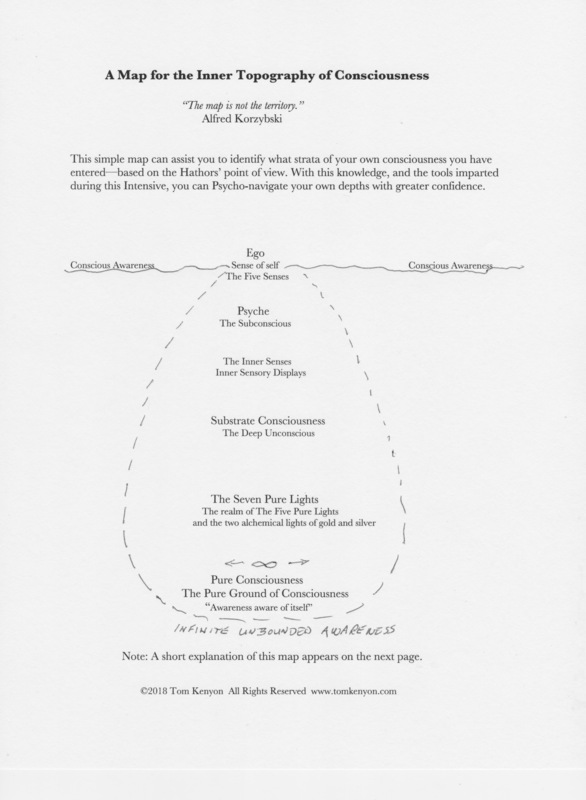 The map, displayed below, shows how different levels of your consciousness interconnect, especially the inner domains of experience. The first level is the Ego, your sense of personal identity. It “lives” and operates in the shallow areas of your being. It has been forged from your personal history and personal beliefs. It is how most of us interact—at the surface of things. It is not generally in touch with the deeper levels of your inner worlds and may, in fact, become threatened by the fathomless nature of them. Your Psyche (or subconscious mind) dwells beneath the surface of your conscious awareness. Thus it is able to be an intermediary between your conscious mind and the deeper realms within you. When you dream at night, it is through your psyche that these messengers of the deep communicate with you. It is at the level of the psyche—and below—that the inner senses present themselves. Just as your five senses receive sensory impressions from the outside world, your inner senses receive impressions from your inner worlds. When you encounter a sensory impression during meditation or dreams, you are experiencing a sensory display. They may seem real, but they are not. Your Substrate Consciousness is your Deep Unconscious Mind. It is a vast reservoir of impressions and energies from past experiences that can affect your either positively or negatively. The Hathors have referred to these types of patterns as Dimensional Tendencies. As you move deeper inside, past the Substrate Consciousness towards Pure Consciousness, you begin to encounter The Five Pure Lights, which radiate two other pure lights (i.e., gold and silver) during internal alchemical processes. This is your ground luminosity and dwells at the edge of Pure Consciousness. The last level (in this map) is Pure Consciousness itself—the Mother/Birther of all things. All dualities are resolved at this level, and there are no internal conflicts because the duality of subject and object simply does not exist. You experience your Self in a very different manner than when you are fixated on your Ego. There is no tension or contraction. You are simply awareness being aware of itself. In the yogas of ancient India this type of awareness is said to have three qualities referred to as Sat Chit Ananda (or Existence, Transcendental Knowledge and Bliss). If you interact with the world from the standpoint of Pure Consciousness, your interactions will be very different than when you respond solely from your Ego. For one, you will feel less challenged by situations around you. And in the advanced states of Spatial Cognizance (i.e. fully anchored in the ground of your being, or Pure Consciousness), you will see the entire world as well as The Multiverse for what it is—a transient and magical display of light. You do not identify with any phenomena of the sensory-based world, including the phenomena within your body, as you are grounded in your root consciousness. However—and this is a vitally important point—unlike psychotic states, which are mental aberrations, in Spatial Cognizance you see the illusory nature of the world as well as The Multiverse; but you are able to negotiate the illusions in appropriate ways—meaning you respond to sensory information appropriately as a biological organism and respond to social cues in a resourceful and relevant manner. As a means to determine where you are during your psycho-navigation sessions, the concept of the Five Levels can prove helpful. This is the foundation level for all other advanced levels of psycho-navigating Spatial Cognizance. It both activates and predisposes your body/mind system to enter a state of high receptivity. This receptive state of body and mind is created by changes in your brain/mind complex. If you decide to master the advanced levels of psycho-navigating Spatial Cognizance, this level is indispensable. There may also be times when, due to the stresses of every day life, you are unable to focus your attention in the manner required to enter the higher levels. In this case, engaging Level One will further your progress through a passive state of increased receptivity. To engage Level One, you simply listen to The Multiverse Sound Meditation (preferably with stereo headphones or ear buds). Relax into the sounds of the meditation and focus your attention on the sonic architecture of the music. Notice the changes in pitch, timbre (tonal quality), harmonies and rhythm. This is not, I repeat not. concentration. If you try to concentrate, you will be forcing your mind to focus on the music in an unnatural manner, and this will create stress—which would be counterproductive. Simply relax your mind and listen to the music. It is okay to space out, which is probably what you need to do when you are over-stressed and find yourself unable to focus your mind. If you are particularly tense, you might find it helpful, in some instances, to relax into your exhales, letting each exhale be more relaxed than the one before it. In this level, you listen to The Multiverse Sound Meditation and add the element of coherent emotion—such as appreciation or gratitude. This is a pivotal and absolutely necessary step before entering the higher levels. The Hathors are very clear on this point. Do not engage the higher levels until you have mastered this ability to create a coherent emotion at will. If you find it difficult to create the feeling of appreciation or gratitude at will, a Basic Primer for creating appreciation or gratitude can be found elsewhere in this handout. While listening to the sound meditation and creating the feeling of appreciation or gratitude, hold the two perceptions together—the auditory perception of the music and the emotional perception of appreciation or gratitude. Hold these two together in your mind as long as possible without forcing it. When your mind wanders, bring your attention back to the music and the coherent emotion. As you go in and out of emotional coherency, while listening to the music, you may find that the vibrational field created by the sound meditation eventually serves to reinforce your state of coherency. In this level you add the kinesthetic sense of a large space. You move into this level after you have mastered Level Two. After entering the coherent emotion of your choice, while listening to the sound meditation, add the felt-sense of being surrounded by a large space. It is important to re-create the felt-sense of a large space. Thinking about space will not work to shift activity in your right cerebral hemisphere. Only the actual feeling of being surrounded by space will accomplish this vital shift in brain processing. Experiment with residing in the coherent emotion of appreciation or gratitude along with the felt-sense of a large space together at the same time. When your sense of the coherent emotion or sense of space fades, simply bring them back together again while listening to the music. As you continue to work with this Level, your ability to hold a coherent emotion and a felt-sense of space will feel more natural, and you will become more masterful holding these two together. At this Level, you have the acquired the ability to Psycho-navigate Spatial Cognizance and explore the Multiverse. From a neuropsychological perspective, simultaneously generating a coherent emotion and a felt-sense of space affects your brain’s neural networks in novel ways. The emotional processing areas of the brain, including the limbic core, are linked to the spatial abilities of the right cerebral hemisphere. And this creates a dynamic shift in mental experience. As you master this Level, you will be able to create a potent psycho-navigational field of subtle energy that you can use to explore deeper levels of your own consciousness as well as other realms of being. Note: If at anytime you feel disoriented or uncomfortable with the sense of expanding space, simply open your eyes and put your feet on the floor in order to ground your energy. This will usually be enough to bring the altered state to a close. If you still find it difficult to ground, rub both your earlobes. This will activate your peripheral nervous system, which will cause your brain to start processing sensory data from external reality (albeit via the sensations in your earlobes) over the internal realities that you have been experiencing. Furthermore, from a Chinese Medicine perspective, major meridians pass through your earlobes, and by rubbing them you stimulate the flow of chi through your major organs, which also helps you to ground. In this Level, you temporarily eliminate your normal sense of inner space (i.e., your body) by dissolving the perception of a personal boundary between you and the cosmos. As you mentally dissolve the boundary between you and the cosmos, you will be propelled into a deeper altered state of consciousness. This non-ordinary state of body and mind generates the feeling of merging with spaciousness, which in turn deepens both the altered state and your sense of interconnectedness. There are three important elements to this Level: 1) listening to the Multiverse Sound Meditation, 2) resting in a coherent emotion of your choice, 3) moving from the sense of a large space in Level Three to the sense of no boundaries between you and the cosmos. As you experiment with this Level, know that you will most likely loose track of one of the elements. This is normal. Just bring your focus back to holding the three elements together at the same time. This is an advanced level of mastery and may take some time and much repetition for your brain to build the necessary neural networks to make this Level effortless. At the end of your session, it is absolutely vital that you return to your sense of normal boundaries. Do not enter outer activities until you have re-established this sense of normalcy in regards to your perception of space. In other words, reside in your skin and not the cosmos. If you wish, you could lie down and rest for a while, floating without boundaries after the session. This can be a very interesting and rewarding time. But you must not leave yourself in a mental state without boundaries. This is both for the sake of your own personal psychological balance, but also the Work is not about floating out in the ethers (so to speak), but rather it is to integrate the two polarities of your sensory-biased consciousness and your unbounded transcendent consciousness into a third state. This level is an expanded version of Level Four. The only difference is that instead of dissolving the sense of personal boundaries between you and the cosmos, you extend this sense of openness to include the entire Multiverse. As you gain mastery of this Level, you will be able to reside in and explore the Multiverse for longer periods of time. Just as with Level Four, it is vital that you return to your normal sense of personal boundaries at the end of a session. According to the Hathors when two subatomic particles interact they create a quantum field-effect. As these particles form atoms, the quantum field-effect gets stronger. And as atoms bond to create molecules, the strength of the quantum field-effect increases in relation to the complexity of the molecular bonds. As a result, the human body generates very complex quantum field-effects. Quantum field-effects are significant for many reasons, but in this Intensive we will be focusing on the use of Trilliums to draw in subtle energies from the Multiverse for the purposes of illumination and transformation. Trilliums act like quantum attractors according to the intentions and beliefs of the person engaging them. The most challenging thing about the art of using Trilliums to draw to yourself subtle energies from The Multiverse is its simplicity. You do not do anything to create them since they already exist in your body at the atomic, molecular and cellular levels. As quantum attractors they, by their very nature, draw subtle energies into themselves—and thus into your body/mind system. It is through the agency of your mind and intention that you qualify the types of subtle energies that you will draw to yourself from The Multiverse. There are two primary forms of subtle energy we will explore through our work with Trilliums in the course of this Intensive. According to the Hathors, as one moves deeper into Spatial Cognizance, the expressions of consciousness become subtler and more refined. Consciousness, in one of its subtler expressions, appears as Seven Pure Lights. These Pure Lights reside at the threshold of Pure Consciousness itself—the very source of all holographic emanations that create the illusory worlds of matter as well as all other dimensional realms. These lights appear as pure, vibrant and scintillating colors. There are five primary colors: white, red, green, blue and yellow, which are called The Five Pure Lights. Under the right conditions of mind, these five colors birth two other pure lights when spiritual (i.e., internal) alchemy is undertaken. These other two lights are pure gold and pure silver. The Hathors contend that the use of pure gold and silver light has immense applications during internal alchemical reactions. But the Mother/Birther of gold and silver light is The Five Pure Lights. Note: The Hathors’ view of The Five Pure Lights is in full agreement with the views held by both the BonPo and Tibetan Buddhism—especially through the Dzogchen traditions. The essence of this view is that matter appears as real to human beings because we are deluded and do not see that matter is an illusion—a result of the interactions of The Five Pure Lights. The Hathors’ view on this is that we are deluded by the play of holographic light that radiates throughout The Multiverse. The source of this holographic light, according to them, is The Five Pure Lights and ultimately Pure Consciousness itself. Furthermore, the Hathors contend that everything that exists in The Multiverse, including all forms of matter, light and energy—regardless of the dimension they reside in—are expressions of Radiance, which is one of the characteristics of Pure Consciousness. The Hathors contend that the Multiverse is permeated by innumerable highly evolved beings who will freely interact with those who have entered a high vibratory rate (i.e., coherency). It is thus possible to draw to yourself radiant emanations from these beings—interact with them and receive information as well as their blessings—by engaging the Trilliums within you. While some of these elevated beings have connections with various spiritual traditions on Earth, most of them are connected with traditions that originated in other galaxies or in other universes as part of The Multiverse. According to the Hathors, some of these sublime exalted beings are not connected to any spiritual tradition within The Multiverse, but rather they reached their lofty self-realization through their own personal explorations. Regardless of their origins, however, the Hathors contend that all of these highly evolved beings have made full contact with both The Five Pure Lights and Pure Consciousness itself—the Mother/Birther of All Realized Masters. I wrote this to address a conundrum that arose in a Hathor message entitled, The Multiverse Sound Meditation. In that message they said that it was vital first to enter a state of coherent emotion such as appreciation or gratitude before exploring alternate realities. The reason for this is to insure that we enter the higher realms of consciousness that open to us when we are in a state of high coherency. This Primer is for those of us, who for whatever reasons find ourselves unable to enter these coherent states. By the end of this exploration into coherent emotions I trust that you will be able to enter into these restorative states whenever you wish. Various studies, including those conducted by the Heart Math Institute, show conclusively that when we are in a coherent state such as appreciation, our cognitive abilities and problem solving skills actually improve. The Hathors, however, promulgate the notion that the cultivation of coherent emotions goes far beyond your own body/mind complex. They say that coherent emotions are crucial when exploring alternate realities such as the Multiverse. 2. For those of you who are are less familiar with these coherent emotional states, I would suggest adding a step in the process. Think of something you appreciate. It does not matter how big or small the appreciation is, just so long as it is something or someone you appreciate. This could be as simple as appreciating a cold drink on a hot day, a beautiful piece of music, a dazzling sunset, or the kindness of a friend or stranger. The list of possible things to be appreciative of is truly endless. If you experience difficult emotions as you work with the method described above, you might find meditating on The Song of Hazrat Inayat Khan helpful as it vibrates the subtle energies of the physical heart. You can find it in the Listening section of the website. Note: All of these can be located in the Articles section of our website. This set of class handouts explores the ascension process from the standpoint of quantum psychology and also includes information and resources about the Sixth Mass Extinction as well as the science of Biophotonics. This is a series of talks by the Dzogchen Master, Tulku Urgyen. This is an invaluable resource for those interested in the perspectives and methods of Dozgchen. 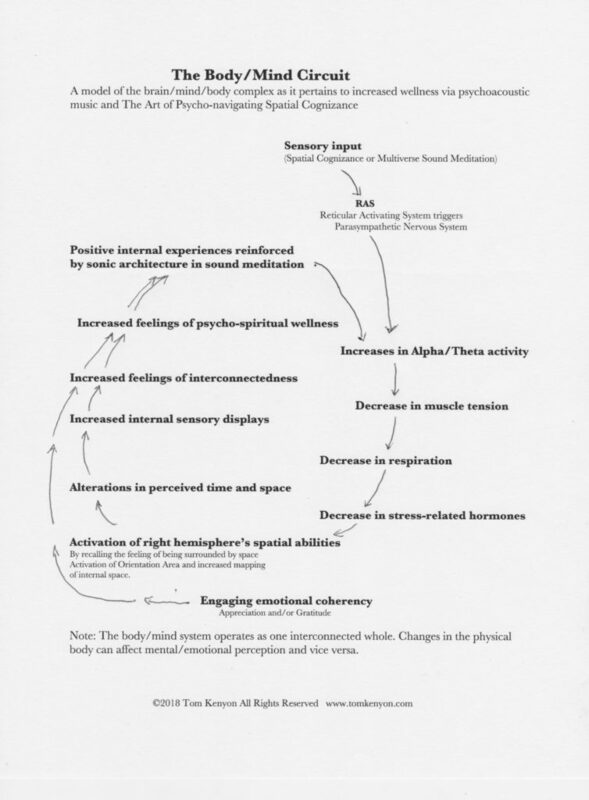 Dr. Grof explores a model of consciousness that goes beyond neurological networks. Based on his years as a clinical psychologist and researcher, this is fascinating reading for anyone interested in a non-local model for consciousness that is discussed within a psycho-therapeutic context. A complete set of recordings from a Hathor workshop, in 2017, that laid the foundation for the concept of Spatial Cognizance. The focus of this Intensive was on the intersection of ancient Egyptian mythology with modern in-depth psychology and a new concept in neuropsychology and neurobiology called Self-Directed Neuroplasticity (SDN) to affect changes in your body/mind system for the purposes of increased wellness. Includes many Hathorian sound meditations. In this psycho-spiritual Intensive Tom dealt with dark shadow material from various perspectives. The goal of this work is to bring unconscious material into the light of awareness for the purpose of resolution and transformation. In the course of this work, Tom channeled a shamanic spirit singer from the Upper Celestial Worlds named Thazu ’kan and an emanation of the Bodhisattva White Tara known as Black Tara—who excels at the transformation of deeply seated negativity. Includes several potent sound meditations. This single CD includes a talk about The Five Pure Lights and a sound meditation for transporting you into the realm of The Five Pure Lights. This recording is only available as an mp3.